Looking for a USED LB2000 EX-II? The LB2000 EX-II 2-axis turning center is built on Okuma’s Thermo-Friendly Concept to ensure minimal thermal growth, and slanted box bed construction translates to unsurpassed quality and rigidity. Equipped with Okuma’s high power, high torque PREX motor, this machine delivers high quality machining from heavy to high speed cutting with a through-hole diameter able to accommodate larger workpieces. The operator-friendly, open architecture THINC®-OSP P300L control makes this machine not only easy to operate, but also to integrate with other peripheral equipment. 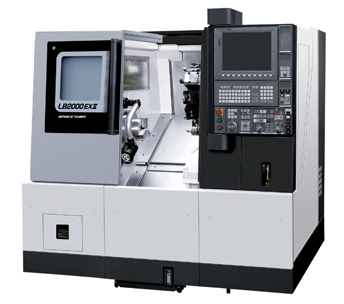 A wide variety of bed lengths, bore sizes and options, including live tooling, sub-spindle and Y-axis, means there is a configuration to meet any shop's requirements. Looking to Purchase a New OKUMA LB2000 EX-II?